This article introduces the features that are available in the Technical Preview for System Center Configuration Manager, version 1611. You can install this version to update and add new capabilities to your Configuration Manager technical preview site. Before installing this version of the technical preview, review the introductory topic, Technical Preview for System Center Configuration Manager, to become familiar with general requirements and limitations for using a technical preview, how to update between versions, and how to provide feedback about the features in a technical preview. Because these are only warnings, they can be ignored. PowerShell: When you connect to Windows PowerShell from the Configuration Manager console, you might receive the following error: Microsoft.ConfigurationManagement.PowerShell.Types.ps1xml is not digitally signed. You can resolve this issue by replacing certain files with signed versions from version 1610. Copy all files with the following extensions from the <install directory>\AdminConsole\bin\ folder in your version 1610 installation: .psd1, .ps1xml, and .psm1. Paste these files into the <install directory>\AdminConsole\bin\ folder in your Technical Preview 1611 installation, overwriting the 1611 version of the files. In this technical preview, for available deployments and task sequences, you can choose to use the pre-cache feature to have clients download only relevant content before a user installs the content. For example, let's say you want to deploy a Windows 10 in-place upgrade task sequence, only want a single task sequence for all users, and have multiple architectures and/or languages. In Current Branch, if you create an available deployment, and then the user clicks Install in Software Center, the content downloads at that time. This adds additional time before the installation is ready to start. Alternatively, in Current Branch if you create an available task sequence deployment, all content referenced in the task sequence is downloaded. This includes the operating system upgrade package for all languages and architectures. If each is roughly 3 GB in size, the download package can be quite large. The pre-cache content feature gives you the option to allow the client to only download the applicable content as soon as it receives the deployment. Therefore, when the user clicks Install in Software Center, the content is ready and the installation starts quickly because the content is on the local hard drive. Create operating system upgrade packages for specific architectures and languages. Specify the architecture and language on the Data Source tab of the package. For the language, use the decimal conversion (for example, 1033 is the decimal for English and 0x0409 is the hexadecimal equivalent). 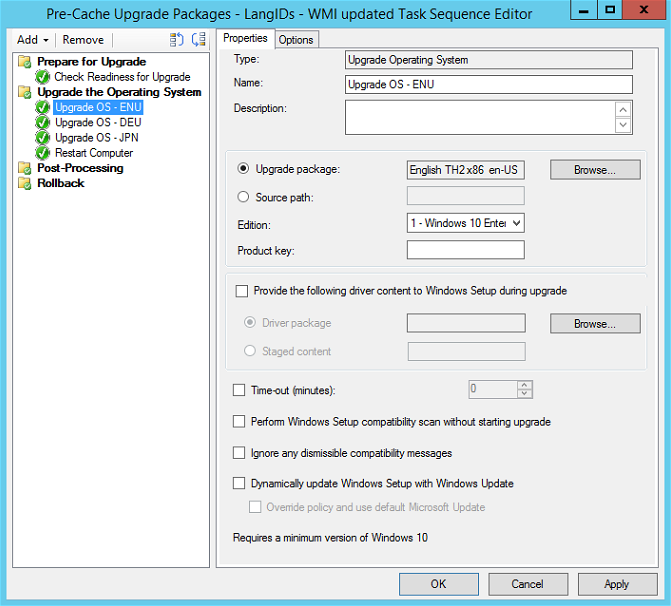 For details, see Create a task sequence to upgrade an operating system. The architecture and language values are used to match task sequence step conditions that you will create in the next step to determine whether the operating system upgrade package should be pre-cached. On the General tab, select Pre-download content for this task sequence. 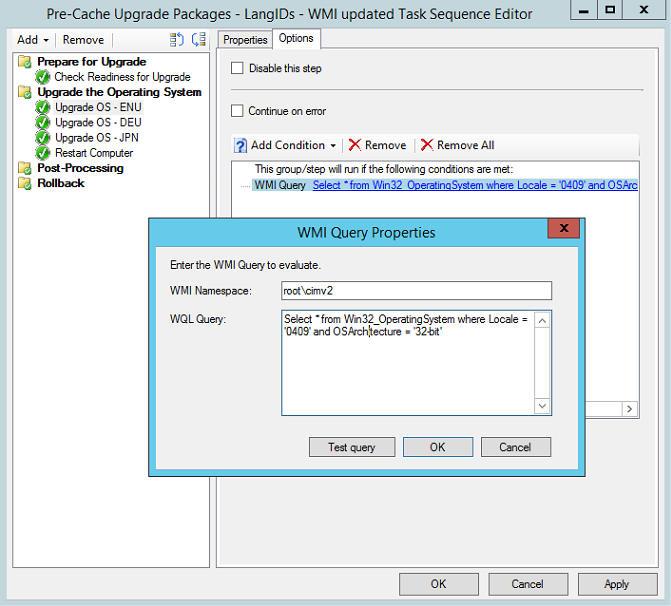 On the Deployment settings tab, configure the task sequence with the Available for Purpose. If you create a Required deployment, the pre-cache functionality will not work. On the Scheduling tab, for the Schedule when this deployment will be available setting, choose a time in the future that gives clients enough time to pre-cache the content before the deployment is made available to users. For example, you can set the available time to be 3 hours in the future to allow enough time for the content to be pre-cached. On the Distribution Points tab, configure the Deployment options settings. If the content is not pre-cached on a client before a user starts the installation, these settings are used. When the client receives the deployment policy, it will start to pre-cache the content. This includes all referenced content (any other package types) and only the operating system upgrade package that matches the client based on the conditions that you set in the task sequence. When the deployment is made available to users (setting on the Scheduling tab of the deployment), a notification displays to inform users about the new deployment and the deployment becomes visible in Software Center. The user can go to Software Center and click Install to start the installation. If the content is not fully pre-cached, then it will use the settings specified on the Deployment Option tab of the deployment. We recommend that there is sufficient time between when the deployment is created and the time in which the deployment becomes available to users to allow clients enough time to pre-cache the content.